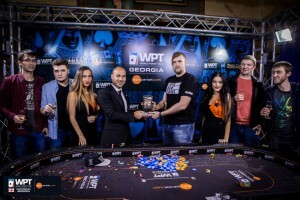 The world poker tour (WPT) Georgia, Tbilisi tournament goes to a poker player named Valentin Smilenko. WPT and Poker Club Management of Georgia organized this particular poker tournament for the second time in this year. The $1,000 buy in main event of the tournament was open for player of the world and was held at Europe-bet.com. The guaranteed cash prize for the tournament was $200,000 which reached $500,000, more than double of the guaranteed cash pool prize. Total number of entries to the tournament was 56 generated a total cash pool prize of $243,000. A debutant from Ukraine Mr. Valentin Smilenko got the first prize of $57,180 and collected the WPT national Trophy as well. Revaz Gudzhabidze of Georgia finished for second place and took home a very god cash prize of $40,120. The tournament was played at Buddha bar one of the best bars in the country and located just in heart of the capital city of the Georgia that is in Tbilisi. After winning the careers first major poker tournament Smilenko told reporters that he is very pleased. He said that I was very lucky to got the good position and seat regarding my main opponent and I played every move in a right way till the final results came to my way. Here is the list of other finalists and cash prize winners of the WPT National Georgia 2015. This was the table of main nine finalists took home some cash prizes at the world poker tour Georgia played at Europe-bet.com poker room. You can read rest of the poker news at real poker online only.